There’s a snarky answer to this one: Find a friend with a pool instead of installing one yourself. But there’s a much better set of answers that should allow you to enjoy a pool at your home without facing legal problems. Why is it such a big deal? Because about 10 people drown every day in the U.S., according to the Centers for Disease Control. Not all of these are attributable to swimming pools, of course, but the statistic does suggest the need for swimming pool safety. Swimming pools are known legally as attractive nuisances. That means a landowner can be held liable for injuries to children trespassing on the land if the injury is caused by a hazardous object on the property that could appeal to children who wouldn’t appreciate the danger. Trampolines and swimming pools are among the most common attractive nuisances, and both pose legal threats to homeowners. However, the threats aren’t insurmountable. 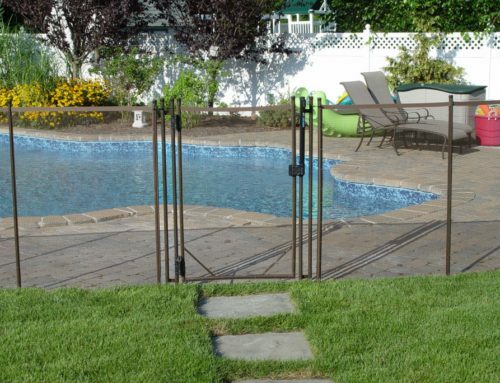 The most important step to take is building a fence around the pool to deter children from gaining access. The fence must be at least five feet high, and it must have a gate that can be – and should be – locked. 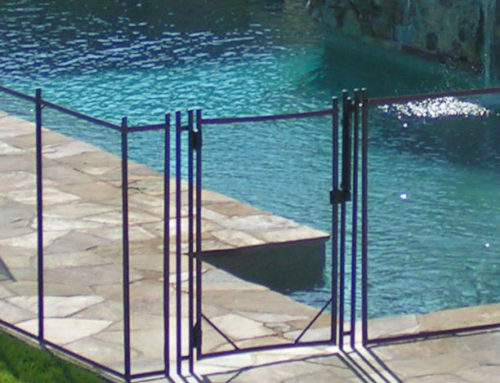 The gate should also be self-closing and self-locking, to ensure that it isn’t ever accidentally left open. You should also look into installing an audible pool alarm. It will alert you if someone falls into the pool when it is unattended. Make sure the adults in the household know how to swim well and have training in lifesaving techniques, including administering CPR. Buy rescue equipment such as life preservers and a shepherd’s hook, which is a long pole with a hook at the end – and store them near the pool. Obtain a swimming pool cover and use it whenever an adult is not at the pool. You can employ either a manual or motorized cover. The cover should be sturdy enough to hold the weight of two adults and a child. Never let children go in the pool alone. There should always be an adult within arm’s reach. Don’t allow running near the pool, and make sure non-slip materials are used on the pool’s deck and ladders. Steps on the ladders should be at least three inches wide. The ladders should have handrails on both sides. Don’t leave toys in the pool; they can entice children. Teach any children who will use the pool to swim as soon after the age of 4 as possible. Don’t allow diving. This will eliminate a leading cause of serious neck and spinal injuries. While you’re at it, don’t allow running around the pool either. If you have a water slide, require everyone who uses it – adults, too – to go feet first. Never allow anyone into the pool who has been drinking alcoholic beverages. Once the season is over, lower the water level of your pool. It is important to keep it covered during the winter months. With proper planning and strict adherence to safety guidelines, swimming pools can provide years of fun. But with great fun comes great responsibility. Let the steps above be a starting point to help ensure the safety of your family members – as well as neighborhood children. The peace of mind you gain will give you greater enjoyment as your envious neighbors look on and wait for an invitation to the fun. This article was contributed by Arthur Murray, who writes for HomeInsurance.com. Arthur has more than 30 years of experience writing for newspapers and magazines. He graduated from the University of North Carolina in 1979 with a bachelor’s degree in Journalism.